The time zone was awkward, but this weekend signified the lifting of the NDA for Artifact, Valve’s new card game based on the Dota 2 universe. This means that yours truly was finally able to stream and write about the game! So let’s get the first article out to share our thoughts on an underrated aspect of the game so far. This tab offers players the options to either play with friends by directly challenging them, to search for games within a given Steam Group Chat, or most importantly to competitive players, to create and join Tournaments inside the game client. No more need for pesky third party websites. This is a game changer for tournament organisers and players. 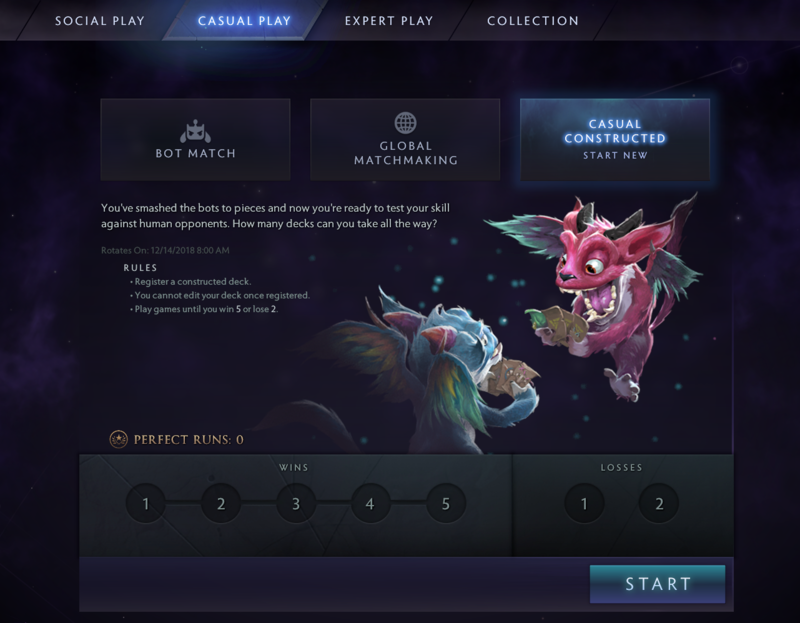 As long as this mode can compete with external websites in terms of features it could be a driving force in Artifact going forward. The tournament creation options allow the host to create tournaments of various sizes (4-128) and various formats, from Swiss to Single Elimination. This sections features a place for new players to hone their skills against bots before taking their constructed deck into Global Matchmaking, a mode that matches players based on skill, with no cost to entry. This is effectively the standard Ladder format in the game. Next up in the Casual Play section is the first of the Gauntlet modes, Casual Constructed. Lock in your constructed deck and see if you can get five wins before taking two losses. This format has no rewards or cost associated with it and is purely for bragging rights! Finally, once you have a grip of the game you can venture to the Expert play section, where the stakes are much higher. Expert Constructed is much like Casual Constructed in that you lock in a constructed deck, but this will cost you one Event Ticket (R29). In return, if you get three wins before two losses you will get your entry ticket back. At four wins you get your ticket back as well as a Card Pack. At five wins you get two packs and your ticket. This offers a reward for experienced constructed players, but with the game so new. Might not be the best mode to start off with until you have built your collection up a bit. Phantom Draft is the first of two Draft formats. Drafts and a format whereby you open a pack (of 12 cards), pick two cards from the pack and pass it on. You then build a deck for the gauntlet from these cards, with some basic cards to supplement your choices. This draft mode is very familiar for players of Magic the Gathering, however with some nuances that are particular to Artifact. Phantom draft costs 1 event ticket to enter, and has a reward structure identical to Expert Constructed. Keeper draft is its bigger brother. In Keeper draft you keep the cards that you pick during the draft phase, unlike in Phantom Draft. The costs for Keeper draft are increased to match, you need to bring your own five packs, as well as two Event tickets to enter. Depending on the meta in this mode, it could well be more efficient than opening your packs yourself if you can mix cards you want for constructed, with those that will serve you well in draft. Finally we have the Featured tab. 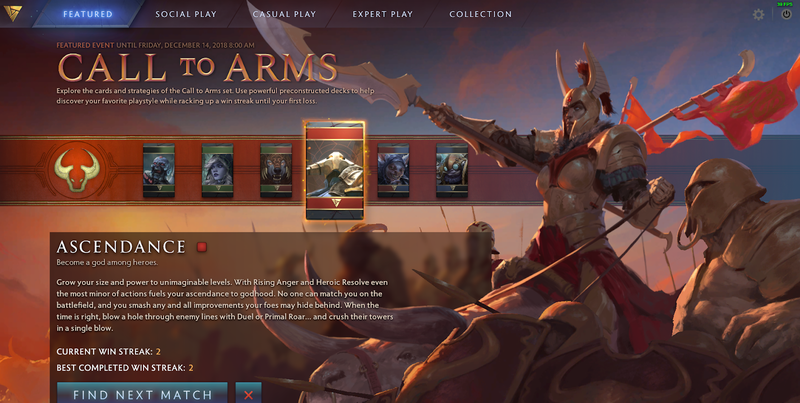 At the current time (and running until the 14th of December), we have the Call to Arms event (the name of the first set in Artifact). The Call to Arms event allows you to choose from pre-constructed decks and see how hot a win streak you can achieve. This is a fantastic mode for teaching new players the different mechanics and synergies that exist across the differing colour combinations in Artifact. This is where I imagine many new players will spend their time learning the game as there is no entry cost and therefore no prize. For buying the base game you will receive 10 packs, and five event tickets. So use these wisely. No, we aren’t talking politics. The in-game economy (i.e. 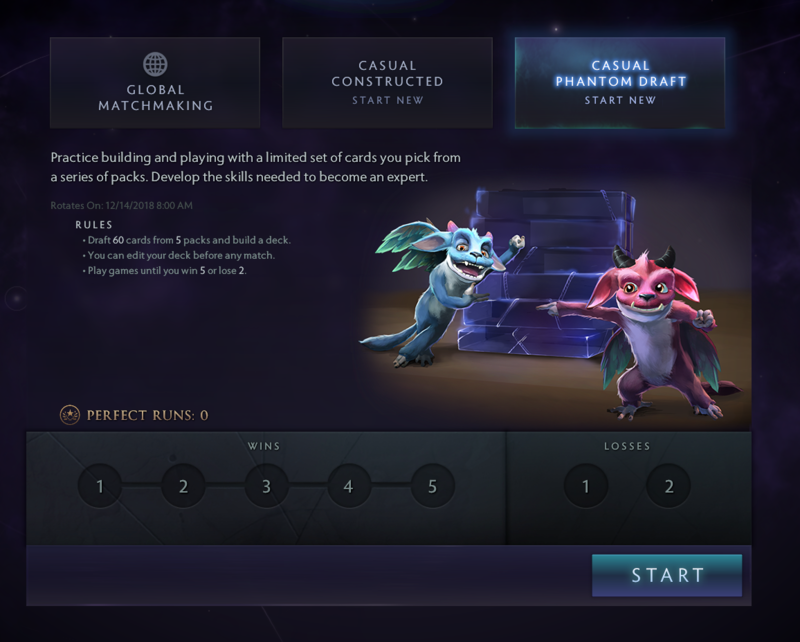 how you earn packs and grow your collection), is the hottest talking point right now in the burgeoning Artifact community. Fears are that the game might be expensive to play (R725 for 25 packs of 12 cards). The cards you have in Artifact will be tradeable on the Steam marketplace, meaning that they each carry a $/R value which is determined by supply and demand. Mastering this market will be the real trick to playing Artifact and building your collection on a budget. This is the game within the game of sorts. You can build your collection slowly over time or look to trade your way to glory. This is something we have seen in a similar marketplace, that being FIFA Ultimate Team (FUT). FUT is a game-mode that uses cards to represent players, with cards such as Cristiano Ronaldo demanding a high price on the digital marketplace. Perhaps we can learn something from Traders in this market. The big difference to note is that you can more directly flex your real life wallet power in Artifact, than in FUT, which has an in-game currency that is used for its player cards. The economy has been the big issue that is turning certain players off the game, but with so many ways to play, that appeal to so many different types of players, there must be some form of Artifact that works for you. We can certainly tell that the financial model differs greatly from Hearthstone, Gwent, and Magic the Gathering Arena, it’s three major competitors in the Digital Card Game space. Before we could even get this article out to publish, Valve have released an update to the beta client! 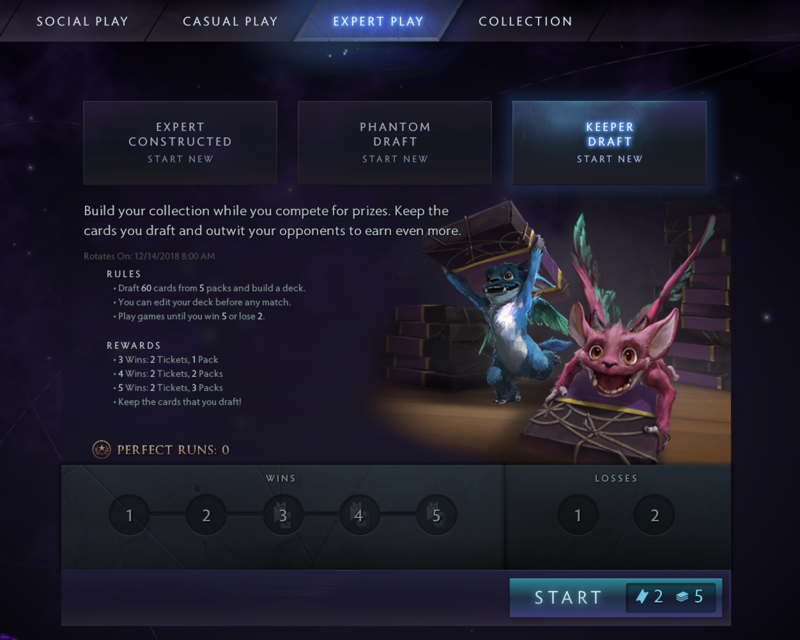 Now allowing users to enter Casual Phantom Drafts which follow the same structure as Phantom Drafts, but with no reward and no cost. This has alleviated many of the concerns about the cost to play the game. This is well timed, with the next big wave of Beta players joining the game. This has also meant that the Bot matches options moves to its own Solo Play tab. I have greatly enjoyed the game on my stream so far, clocking in 15 hours of streaming right after the NDA dropped. I’ll definitely be playing more, and writing more as we learn more about how the game will fair, both in terms of player enjoyment and it’s economy. Let us know which game mode appeals to you the most, how you think the economy might play out or if the updates Valve have made are enough. Or come and discuss it on my stream where I will be streaming Artifact all week, starting at 7/8pm SAST (UTC+2).